Eighth grade. Hard to believe. 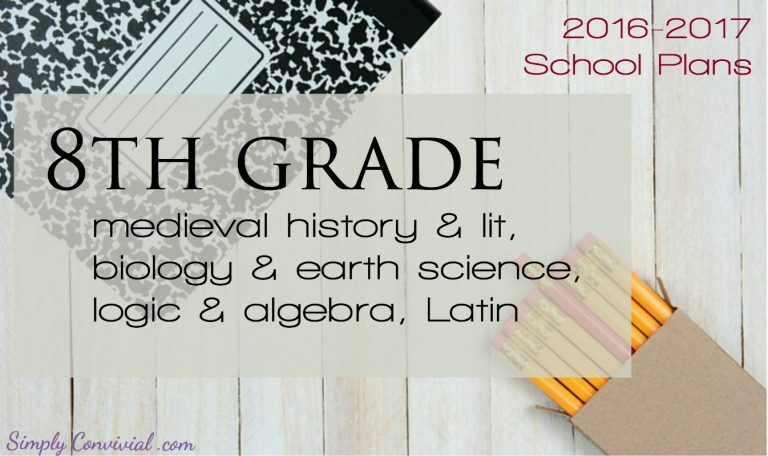 When planning eighth grade, perhaps more than any other grade, you have to consider what your plans are for the following years. Will you choose a day school high school? Then your year must focus on ensuring they’ll be ready for tests, specific studies, and homework. Will you homeschool high school? Then your year should include training for independent study, writing instruction, and making sure you’re ready for whatever extra requirements your state might have for tracking and crediting work. P.S. 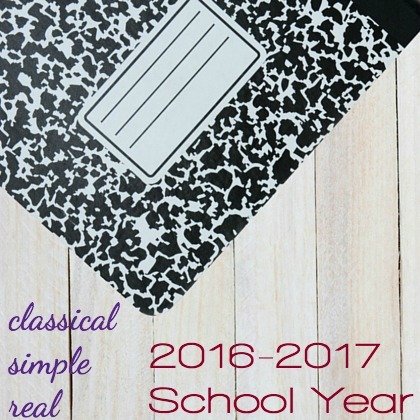 If you need help with your homeschool planning, Plan Your Year is where to get it. I make my plans on spreadsheets and in Evernote, but I follow Pam’s steps to make sure I don’t miss anything. She’s got it all laid out and makes it easy to create a unique plan for your family. Plan Your Year will help you create a plan you can execute with confidence. Our current plan is to homeschool through 10th grade and then send our kids to the local community college, where they can graduate with their AA & high school diploma (if they want one) at 18 – it’s what my husband and I did, and it worked well for us – plus, it means I can pass on doing high school science. So, that means I have only three more years of homeschooling my oldest! With our three-year-history-cycle plan 7th-8th-9th is a set, then we’ll see where we are with 10th and then on to community college (where he can take lab science classes and have a math instructor for the higher levels). So 8th grade is primarily a continuation of what we were doing in 7th grade, because except for a few missteps, it was a great year. In addition to reading his Bible (or listening to it), which is life and not school, and in addition to Morning Time with the family, Hans will continue to study through the entire Bible with Starr Meade’s The Most Important Thing You’ll Ever Study. 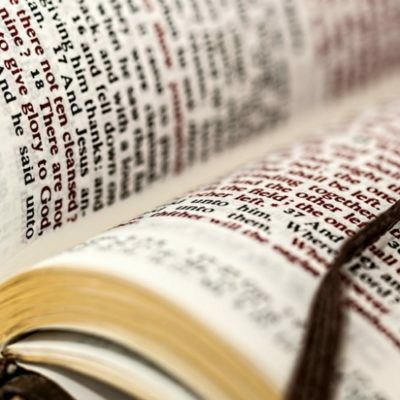 It comes in four volumes of workbooks, where the student reads the next chunk of Scripture (it’s sorted more or less chronologically, but when you’re finished you’ve read the whole Bible), reads a commentary bit in the book, then answers short-answer questions in the workbook. It’s not broken up to be easily assigned across a week or across a 36-week school calendar, so when we began last year I simply assigned that he “do the next thing” in the book, working at it for 30 minutes a day. He finished 2 of the 4 volumes at that pace (with days off for good reasons and bad, of course), so we’ll do 3 & 4 this year. Also, as a group twice a week, we’ll continue studying the Heidelberg Catechism 1 Lord’s Day a week using The Good News We Almost Forgot & The Heidelberg Catechism Study Guide. Last year we left off with Lord’s Day 25, and there are 52 total, so we should be able to finish as long as I don’t slack off. Math-U-See for the win! We’re continuing on this track because we have no reason not to. Hans ended 7th grade half-way through the Algebra book, so I have the Geometry and Algebra 2 books on the shelf – when I place a Math-U-See order I like to have 2 books ahead for each student just so I don’t have to scramble. At this point, my plan is to continue with Math-U-See through 9th grade and then see where we are, where his test scores are, and decide what’s best next. In 10th grade my focus will turn toward helping his math test scores so he can enter college-level classes. When we start back we’ll just pick up where we left off and we’ll move forward as he has mastery of each lesson, whether that takes two days or ten. I ❤ MUS. Latin is math and logic with language. 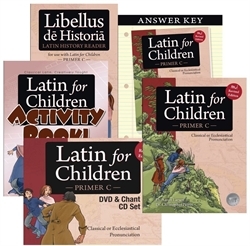 Hans finished Latin for Children Primer B and so will begin Latin for Children Primer C this year. It has taken us at least 2 years to finish each level so far, but I am going to do my best to keep us on track to finish LFC Primer C in one year. Then in 9th grade he’ll have some negotiating power as to what he wants to pursue in high school. It’s possible this will be his last year of Latin (he’d like to think so, anyway), so I’m going to try to make it count. Once a week I will sit down with both Hans & Jaeger and we’ll work through Lingua Latina as a supplement. I bought the kindle version so all three of us can have our own copy for the price of one. 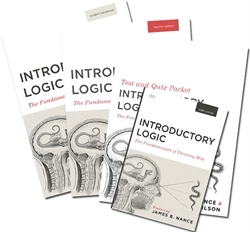 Last year we did informal logic with The Art of Argument, but this year we’ll give formal logic a shot with Introductory Logic. 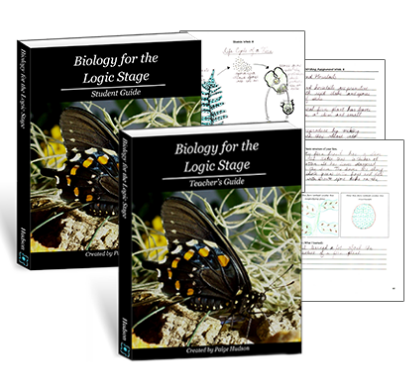 I took a logic class in college, so it’s not all brand new to me, but I’m fairly excited to dig in (as much I can – which probably won’t be much) with him. He’s already half-way through Algebra, so he should be ready for it. If he’s not, we’ll just postpone it until next year – no biggie. Again, to keep the consistency and the level of instruction up-to-snuff, I’m relying on DVD instruction for this one. I’m sure Jim Nance – even prerecorded – will be a much better teacher of this material than myself. Plus, Hans can do it while I’m teaching the others. What I simply must make a priority is grading his work! If I don’t look at it, we might as well not be bothering. That’s just the reality of life, not a slight against him or myself – we all let things slide when we think they don’t matter, and checking work is how we let our kids know it really does matter. We’re in our medieval year now, and Hans has already read widely in the history genre, so I went with the AmblesideOnline Year 7 book: A History of the English-Speaking People volume 1 by Winston Churchill. If he reads one chapter a week from Churchill (I’m not using the AO schedule for the book), he’ll make it into the second volume and get to the reformation era. But he can do more than one chapter a week in history, so I scouted around for an overview of medieval times from a broader European perspective rather than simply English history. I looked at a few books, bought a few kindle and used paperbacks that looked promising, and with a little trepidation, have assigned a little less than half of the impressive tome Europe: A History. Reading about 10 pages a week will take Hans through the medieval section of the book. I scheduled it out, but I’m holding it with a loose hand. We’ll see how it goes. For the first term we’ll persevere even if he’s less than enthusiastic, but if it is actually a slog, we’ll replace it with something else – probably an audiobook or Great Courses series. With each reading assignment, he’ll add at least one thing to his Book of Centuries and he’ll add one Churchill quote to his new commonplace book. Instead of writing a paragraph narration for each chapter he reads, we’ll do brief narrations together while getting steps and he’ll write one 5-8 paragraph paper with a thesis on an event, person, or theme from his reading per term, which we’ll work on over the course of the term. 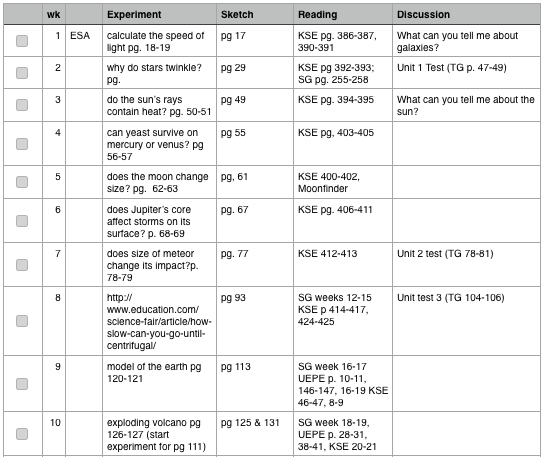 This year we’ll do an “actual” science curriculum. There will even be experiments. Gasp. I’m just going to go stick my head in the sand (i.e. get steps up and down the street in front of my house) while experiments are in progress. That’s ok, right? I chose Elemental Science as our middle-grade science curriculum because it’s what Jennifer Dow chose for her co-op and it does look decent (although they do use comic sans in their ebook). I’m sure Jennifer will do all the experiments with lab sheets and great conversations instead of plugging her nose, covering her ears, and closing her eyes, though. Now, I am simplifying it. I’m not using a curriculum as-is – that wouldn’t be right. 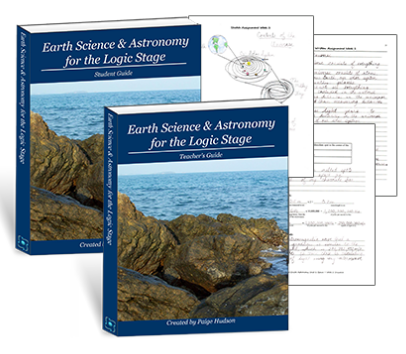 Elemental Science is written for the homeschool setting though, so they know flexibility is key. They’ve made it easy to pick and choose, to cut back or expand, and to use their material in a way that fits your situation. That was an important factor in my decision to go with the program. Vocabulary assignments? Nope. Every project? Nope. Outline entries from Kingfisher? Nope. Sketch? Yes! Write a summary? Yes! Read? Of course! Do some of the projects? Well, ok, fine, if I must. When discussing with my husband which science to select for 8th grade, keeping in mind he’ll most likely do community college science in high school and that I only have 3 more years to plan for, my husband asked if it’d be possible to choose and arrange the lessons so as to cover two science topics this year and after reflecting on the options and the courses of study, that’s what I opted for. So we’ll do Earth Science and Astronomy for the Logic Stage in the first half of the year and Biology for the Logic Stage in the second half of the year. To condense the programs in this way, I will pick and choose the science experiments and cut out everything I deem “busy work.” Plus the reading in this program is fairly light, so I don’t think it will be a problem. Don’t worry, I’ll let you know whether or not it works for us. P.S. I bought the ebook versions. This school year I will be teaching a class for literature & writing which both Hans & Jaeger will take part in. We’ll do medieval lit and practice writing on themes or topics pulled from what we’re reading. I have settled on our books, but not the discussion themes or writing topics yet. That class won’t begin until September, while we’ll begin our independent studies in July, so it’s lower on the planning priority list right now. We’ll read Beowulf, Sir Gawain & the Green Knight, a paraphrasing of Canterbury Tales, and Fierce Wars & Faithful Loves (a paraphrase of The Faerie Queene). This will be mostly the same group I had last year for logic & poetry & grammar, so I’ll also add in some medieval poetry between books and we’ll diagram together on the board to keep up our skills. I’ll have the kids keep a commonplace journal, but my goal is to make the atmosphere of the class like a book club. Instead of lecturing, I’ll be leading book discussion and getting them to voice opinions – and then back those opinions up with evidence from the text. It’ll be fun. Middle school kids are great for this sort of thing. There is no attempt at an assigned reading list this year. Instead, I will do with Hans what I did with his brother last year: Every week I ask him to select one book each in the history, natural world, and story genres. He can choose from our shelves or we can find something at the library together. If he doesn’t finish one of the books in a week, it simply carries over to the next. And I don’t make them finish every single book they start, either. It’s ok to try and then reconsider. He’ll continue in piano lessons once a week with daily 20-30 minute practice. Exercise will be on his list, and I think we’ll talk about setting some goals so he has something to work toward rather than just using that as an excuse to ditch his math for a few minutes to get some fresh air (a strategy I recommend, but rarely then is actual “exercise”). 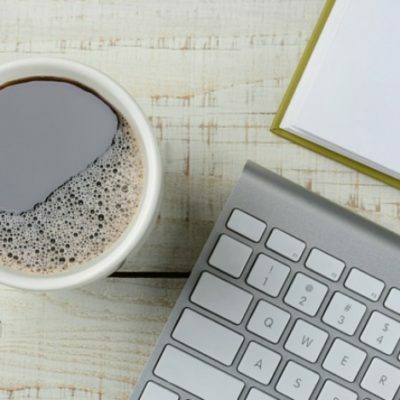 After my workshop on homeschool checklists a couple months ago, a reader sent me an email about her kids’ checklists on Trello – an app and website. I was intrigued. After investigating and talking it over with my husband, we’re going to give it a go for all students in double-digits. The children younger than 10 hardly have any independent work at all, and only have a checklist to start building the habit of making sure the work is done before playing, not because they really need it. 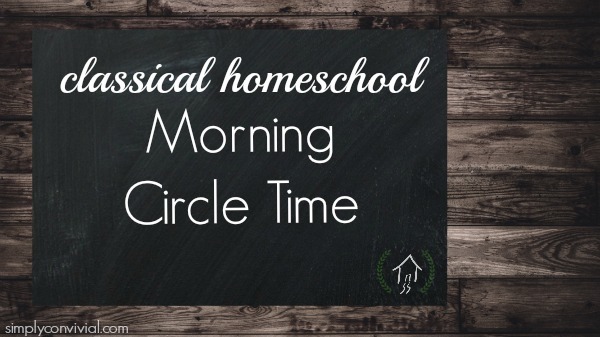 If you’re homeschool planning also, make sure to check this resource out! 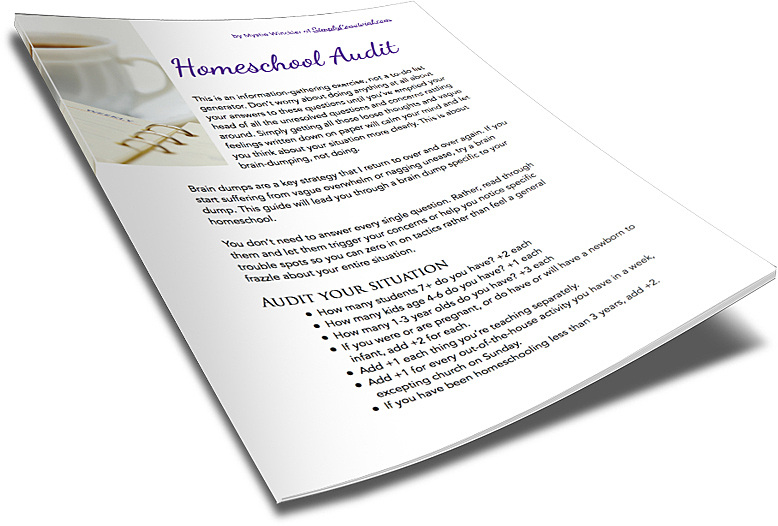 While the school year is still fresh in your mind and in front of your attention, do a thorough homeschool-related brain dump. I call it a Homeschool Audit. It will make your summer break more refreshing. It will make your next school year better. If we can set those up with intention, we will have better, more satisfying, less draining homeschool days. Thanks for sharing! I have continued to enjoy and be inspired by your blog! You mentioned that you went to community college to get “AA & high school diploma.” Forgive my ignorance, but what does “AA” stand for? Associates degree? Dual enrollment? Thanks! I’m sorry! Yes, A.A. is an associates (2-year) degree. Our state has a dual-enrollment program between the high schools and community colleges – classes at the community college in the junior and senior year count at the high school as well as towards the degree. 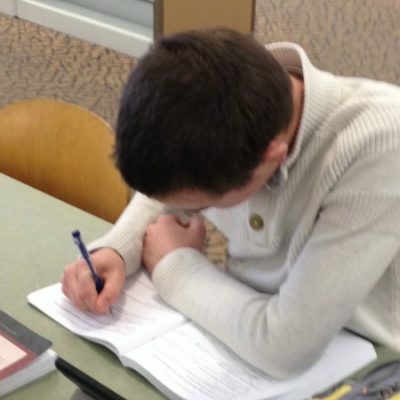 Mystie, could you share more how you are preparing for the dual enrollment? Does your state require certain prerequisites or tests? Your Medieval is very close to ours for next year. 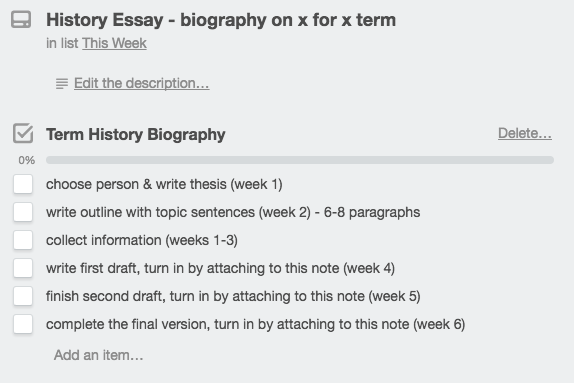 We are adding in some writing assignments, perhaps competitive essays, but I haven’t thought them through yet . . . I’ll stay tuned to see what great ideas you have. Love Ambleside! It really makes my daughter think, and make connections. By competitive do you mean finding writing contests? I hadn’t thought of that! Hi Mystie, I’ve just “meet” you online! Are you preparing your children for a four year liberal arts college after receiving the associate’s degree? I think they will be prepared for that if that’s what they want to do, but we’re keeping our minds and options open for what to do after they graduate. Paying for a private college education is not high on our list of priorities. :) We want to help our kids get established in responsible, adult life as soon as they are ready for it – so if our sons especially have a career or path in mind already, that will also factor into our decision. We’re also open to non-college, unconventional paths as well. My hope is that I will have prepared my kids to continue their liberal arts education as a part of normal life, whatever they go and do. Ack, only three more years! (Granted, I only have 4 with my oldest, but still!) I enjoyed reading through your plans, and I’m intrigued by your Trello checklists. I’ll definitely be curious to hear how that works for you! And I particularly enjoyed your Science section. :-) I paged through that program recently and I like how you are paring it down – from my brief perusal I definitely think it needs it! I’m unfamiliar with that science curricula. I’ll definitely be looking into it…thanks!